Plantation Bay recently launched a seven-course tasting menu, Philippine Voyager, which highlights the flavors of the Philippines. For only P1,200 nett per person, diners are taken on an exciting gastronomic trip around the country. This set menu is the first prepared by Executive Chef Lee Ramas and his team. Chef Lee shares his artistic take on famous Filipino food through Philippine Voyager. He explained that Filipino food is naturally delicious and mouthwatering, but because of the diverse selections and variety, it is rather difficult to pinpoint any particular dishes to showcase. He hopes that with this offering, our very own Filipino food can be experienced by other nationalities. 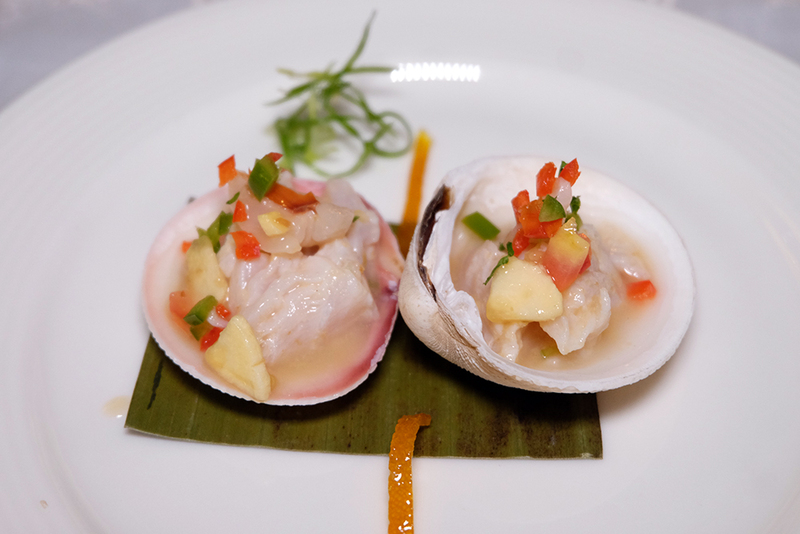 Our degustation started with Manny’s Ceviche – thinly sliced pugapo sashimi with a hint of tropical fruit in red chili, calamansi, and native spicy vinegar from Mindanao, served on half shells. Don’t even attempt to grab a fork, and just grab the shell straight to your mouth and slurp it all in. By doing this, you get an explosion of flavors: sour, spicy, salty, and umami. Up next is Fresh Palm-Heart Lumpia Taco. I really love fresh lumpia, and this one’s quite unique because instead of the usual lumpia wrapper, they opted to serve it in a shot glass using a cone-shaped taco. Pork, shrimp and Cebu-style garlicky cream sauce. Again, best eaten with the hands to add to the multi-sensory experience. Adobo is unarguably one of the staples of Filipino food. This refreshing take features chicken and pork, slow-cooked for hours, and served on deep-fried home-cooked bread. My taste buds loved this one! The Adobo Toast is best complemented by the Old-Fashioned Arroz Caldo made with raw rice grains, reduced chicken broth, and seasonings. It looks so simple, but when you take your first bite, you’ll be pleasantly surprised by how good it is. For me, the highlight of the meal would probably be these two. With a medley of spices, Kare-Kare made with beef shank and homemade XO sauce is served pre-piled on three ceramic spoons, that’s just about a mouthful. Manny Gonzalez, resident shareholder of Plantation Bay Resort and Spa, wants to promote kare-kare as the country’s national dish because according to him, it is one of the most distinctive beef dishes in the world, and he has not encountered anything similar in all his travels. Meanwhile, last on the savory side of things is the Pansit Malabon, served in a goblet at that! Crunchy, fat rice noodles, chicharon flakes and to top it all, an intense sauce, that would actually make you want to ask for another serving. To cap it off is the Pinoys’ ever-favorite dessert, the Halo-Halo! Instead of the typical shaved ice, Plantation Bay uses their extra creamy homemade langka ice cream with candied jellies, fruit preserves and dry crunch. Unmistakably very Filipino, yes? Plantation Bay’s Philippine Voyager celebrates good Filipino cooking while keeping the food soul-satisfying and meaningful to a wider audience. Experience the best of Filipino flavors every Tuesday and Friday at Palermo.